Hey, how many people remember the animated movie from a few years back called The Nut Job? Not many right? 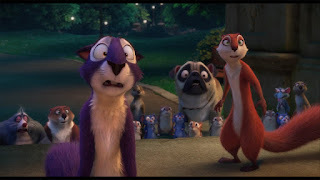 Well, now we have a sequel, The Nut Job 2: Nutty by Nature a movie that tries to continue the adventures of Surly (Will Arnett) and Buddy and the other park animals. There is one main problem, the whole thing feels like an empty cash grab. The beginning of the film doesn’t make much sense from the end of the first one. There is really no heist here but in a way they're trying to save their park from being redeveloped into an amusement park. So now the park animals have to face a bunch of evil humans. The movie tries to cover all the same story beats of the first but a little different and it drops the ball a lot. How so might you ask? The first part that really confused me is the animals in the nut shop from the first movie a year or so later just partying and eating, but they got enough nuts out of the shop in the last one so there wouldn’t be a need to go back. But then the shop is blown up and now the animals have to find out how to survive and save their home. 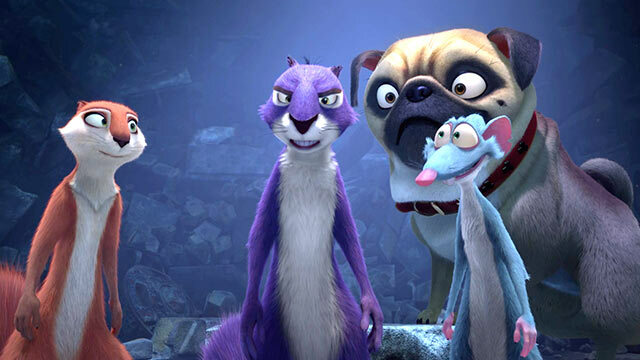 For some reason Surly meets some white mice with a leader voiced by Jackie Chan, this mouse feels like something to put in just for the Chinese market (and it’s financed by a Chinese company) to help sell the movie there. Also, the movie is very serviceable animation-wise. The characters look decent movement and design wise, consistent with the previous one. The lighting on this one feels flat and also a lot of everything feels in the same depth or focus. Even at night everything feels so well lit that it’s almost the same as in the morning settings of the movie. The voice acting is pretty unlively in the performances. There didn’t seem like much stretching to really sell the action going on. The overall tone of the movie felt like it was trying a bit too hard to be funny and then at certain moments too serious for a movie marketed for early elementary school aged children. The tonal shift at the end of what felt like act two was jarring. A lot of the jokes weren’t landing and you can probably sit there reading this like what would an adult know about being funny to a kid? I watch a ton of cartoons, hardly any adult swim ones and I rate the comedy to stuff in cartoons I see on Nickelodeon, Disney channels or CN and most of these jokes just aren’t funny or set up well. Too many are just lazy slapstick jokes are Surly’s expense with some random gross out humor from the dog characters. So from all this, I think you can see I didn’t really care for this movie, I think people should really sit this one out and let it fail so that hopefully they learn not to put out a project like this into the market just to make a little cash. Now I say this not to disparage all the hard work people put into making this but in the end, you can see this was not a movie started out of a need to tell a story or really even workshopped into something that feels like it is. It’s just a bad poorly conceived animated movie for the late summer being propped up by having Jackie Chan do less than ten minutes of dialogue.